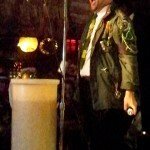 February 2013 update: How big a punch can Tiki Month take? 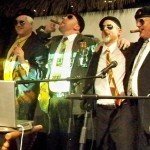 Tropical drink revivalist Jeff “Beachbum” Berry and his “Rum Rat Pack” – four of the world’s most noted authorities on the cane spirit – banded together on stage at the legendary Mai-Kai restaurant in Fort Lauderdale during the afternoon of Saturday, June 12, to celebrate Tiki’s favorite elixir. Jeff "Beachbum" Berry leaves no doubt about what this event is all about. 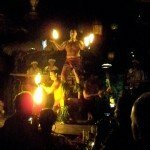 More than two hours and a thousand or so cocktails later, the 200 Tikiphiles attending this 10th anniversary Hukilau exclusive event were swept up in a movement not seen in these parts of the tropics since Fidel’s rise to power in another rum-soaked nation just to the south. 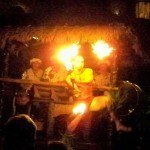 But in the friendly environs of The Mai-Kai, which actually pre-dates Castro’s revolt by several years, the revolutionaries were armed only with good spirits. Lots of good spirits. 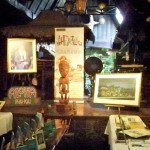 Before the symposium even started, several samples of high-end rums awaited us as we were seated in the Polynesian palace’s main dining room. Beachbum Berry wasted no time in introducing us to some of the fine rums on display this afternoon: Chairman’s Reserve from St. Lucia; Rhum Clement VSOP and La Favorite Rhum Agricole, both from Martinique; Lemon Hart 151 Demerara rum from Guyana; and Dos Maderas (a blend of aged rums from Barbados and Guyana). 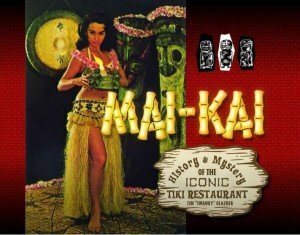 Of course, more than 50 cocktails from The Mai-Kai’s legendary tropical drink menu were also available, and many in the audience wasted no time in beginning the evening’s imbibing early (The Atomic Grog included). 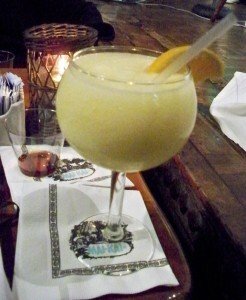 I opted for one of the restaurant’s signature drinks, the Derby Daiquiri, a refreshing frozen lime-orange concoction created by the late, great master mixologist Mariano Licudine. Mariano’s son, Ron, was in attendance for the festivities and was happy to entertain us cocktail geeks with stories from his youth when his dad ruled the tropical drink world. The Mai-Kai's signature Derby Daiquiri is the perfect accompaniment to the many rum samples. 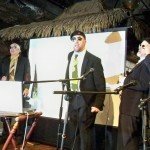 Shots of rum littered the tables, so Beachbum Berry suggested we use them to top off our drinks as he prepared to introduce the first Rat Pack speaker. I was one step ahead of him, the Lemon Hart already creating a deliciously potent addition to my mild daiquiri. I highly recommend this combination. First up from the panel was Wayne Curtis, author of the book And a Bottle of Rum: A History of the New World in Ten Cocktails and contributing editor at The Atlantic magazine. 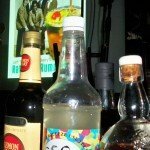 Curtis discussed the history of rum, tracing its popularity back to the British Navy in the 1600s and the advent of the rum punch, the blueprint for the modern-day tropical drink. 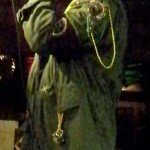 He also explained the origins of the word proof and demonstrated the “gunpowder test” used by seamen to prove a spirit’s authenticity. Aboard British Navy ships, rum rations were often watered down by the pursers. To combat this, the rum was mixed with gunpowder and a test was administered to prove its worth. If the mixture went up in flames, it was declared 100 proof and the purser was spared retribution. A liquor of 50 percent or more alcohol content burns when exposed to flame, hence the beginnings of the proof ratio that continues to this day. 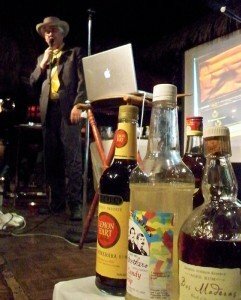 Wayne Curtis, author of the book "And a Bottle of Rum: A History of the New World in Ten Cocktails," makes his presentation. Curtis put this theory to the test with actual gunpowder (don’t ask how he smuggled it on his flight from New Orleans). The 151-proof Lemon Hart was easy to flame up, but Curtis struck out with a 114-proof Smith & Cross Jamaican rum, proving that today’s methods of determining proof are probably a bit more reliable. Next up was Stephen Remsberg, a fellow New Orleans resident purported to own the world’s largest private rum collection (more than 1,000 different bottles, some dating back to the 1880s). Remsberg further elaborated on the history of British Navy rum, in particular a special variety called London Dock Jamaican rum. Rum for the Royal Navy was typically sourced from Britain’s territories in the Caribbean and shipped to London to be blended and bottled for consistency. The London Dock brand was extremely popular for more than 250 years, but that all came to an end during the London Blitz of World War II, when Nazi Germany bombed the London Docks, accidentally wiping out the warehouse containing most of the world’s supply. London Dock rum virtually disappeared for more than 60 years. But, happily, the London Dock style of Jamaican rum has been revived by the aforementioned Smith & Cross, which makes an acclaimed product the traditional way, at the strength required by the Royal Navy. We sampled two Jamaican Planter’s Punch cocktails, one made with the popular Myers’s brand and a second made with half Myers’s and half Smith & Cross. The sharp flavor and high-octane Navy rum shined in the latter drink. 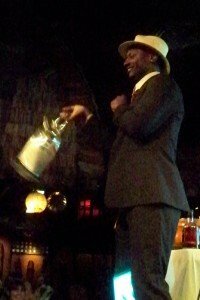 Ian Burrell, founder of the UK Rumfest, shows off his ‘ninja shake’ with a large teapot shaker. Halfway through the Rumposium, a certain mellowness had begun to set in, perhaps due to the many cocktails and rum samples. Or maybe it was Remsberg’s deadpan delivery. Perhaps a bit of both. But this was soon remedied by a hilarious sketch that riffed on the British Navy’s debate on the need for a rum ration, setting the stage for the final two speakers, who energized the Hukilau faithful with their call to arms. Ian Burrell is known as the “Global Ambassador for Rum,” and it quickly became apparent how he earned this title. Founder of UK Rumfest, Europe’s first-ever festival to celebrate the diversity of rum and now the biggest rum festival in the world, Burrell isn’t shy about proclaiming his love for the spirit. 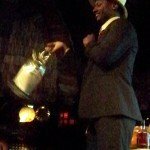 A native of Jamaica, Burrell recalled his first rum experience, when he was a newborn and his mother put a little bit on his lips to help him to sleep (a cultural tradition, he swears). The master “edu-tainer” took us on a rollicking tour of the Caribbean islands and the punches of each location. 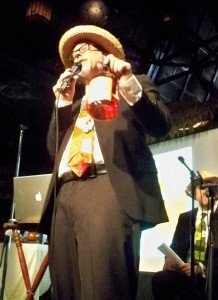 He then took over the onstage bar and whipped up a special drink for The Hukilau, “Taboo Hardwood,” which included coconut water, lime, sugar, bitters and a special rum infused with bark that boasts medicinal qualities guaranteed to make every man in the room rise to the occasion. This sample drink (featuring Chairman’s Reserve spiced rum in lieu of the infused “hardwood” rum) and Burrell’s next drink were the hit of the event. Citing his grandfather’s mystery cocktail book from Jamaica, he whipped up an amazing pre-Tiki cocktail that may (or may not) have inspired the original Mai Tai. Dubbed the “Mai-Tiki Cocktail,” this was a complex food-and-drink experience that involved eating sugar- and orange-coated almonds, then washing it down with a potent tea-infused mix powered by Dos Maderas rum. Martin Cate, owner of the Smuggler's Cove bar in San Francisco, kicks off the Rumposium finale by making a special punch for the 200+ in attendance. 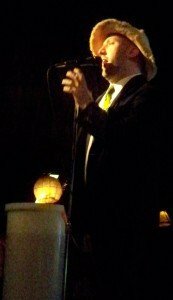 The stage was now set for the finale featuring Martin Cate, owner of Smuggler’s Cove in San Francisco and prime mover of the neo-Tiki bar movement (he also founded the acclaimed Forbidden Island in Alameda). Cate – a world-class mixologist hailed by the Los Angeles Times, The New York Times and Esquire – appeared humbled by The Mai-Kai. He said he was “honored and blown away” to be “on hallowed ground” for this special event. Later, Cate told The Atomic Grog that he considered The Mai-Kai to be “the mothership” and a source of inspiration. His presentation delved into the history of punch, “from the spice trade to the Mystery Girl.” Based on a simple formula – 1 part sour, 2 parts sweet, 3 parts strong and 4 parts weak – the rum punch was popular into the 1800s but fell out of favor during the industrial revolution. 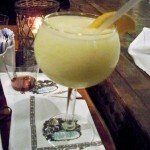 As Cate explained, an economic divide caused the upper class to shun big bowls of punch in favor of a new invention: the cocktail. Fast forward to the 1940s and post-Prohibition America, where the modern era of tropical mixology was in full swing. Victor Jules Bergeron Jr. (aka Trader Vic) had spent many years researching native cuisine and drinking customs. 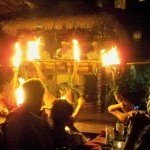 Obsessed with communal drinking rituals, Vic starting serving drinks in large vessels (the Kava Bowl, the Scorpion Bowl) and revived an ancient tradition. 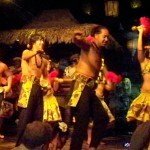 These communal drinks remain staples in Tiki bars to this day, popularized by iconic rituals such as The Mai-Kai’s Mystery Drink ceremony. After giving us some very useful home bar tips, Cate proceed to make punch for 200 intimate friends. One by one, ingredients were poured into a giant punch bowl: Lemon juice; darjeeling tea; cinnamon syrup; vanilla syrup; and 240 ounces of six different rums (Chairman’s Reserve, La Favorite, Rhum Clement VSOP, Smith & Cross, Dos Maderas and Lemon Hart 151). 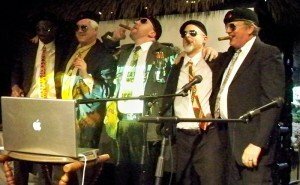 Their mission complete, members of the Rum Rat Pack enjoy victory cigars. Rum is the greatest spirit in the world! We pledge to demand great rum! We pledge to defend the honor of rum! We pledge to fight for rum! We pledge to join the Rum Revolution! 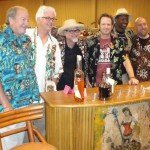 The Atomic Grog’s Jim “Hurricane” Hayward (third from right) with Jeff “Beachbum” Berry (third from left) and the Rum Rat Pack before the group’s meet-and-greet at the Bahia Mar Beach Resort during Friday’s Hukilau festivities. 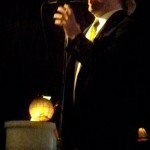 The stage is set for the Rum Rat Pack. Jeff “Beachbum” Berry leaves no doubt about what this event is all about. 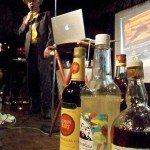 Wayne Curtis, author of the book “And a Bottle of Rum: A History of the New World in Ten Cocktails,” makes his presentation. Martin Cate, owner of the Smuggler’s Cove bar in San Francisco, kicks off the Rumposium finale by making a special punch for the 200+ in attendance. 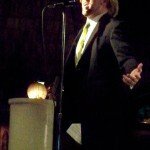 Martin Cate and the rest of the Rum Rat Pack challenge the audience to defend the honor of rum. 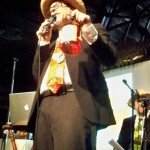 Martin Cate and the rest of the Rum Rat Pack challenge the audience to demand great rum. 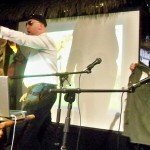 Martin Cate assumes the role of rum revolutionary. Ian "Rum Ambassador" Burrell enjoys the dance that comes with his Mystery Drink. 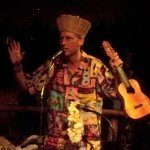 Master of ceremonies King Kukulele gets everyone in the Hukilau spirit. 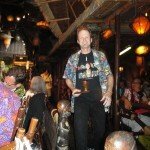 Hurricane Hayward makes his way back to the dinner table after receiving an award for his role in The Hukilau as Master Mixologist coordinator. 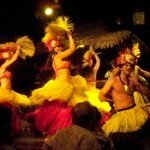 The Mai-Kai’s famous Polynesian Islander Revue. 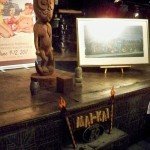 On Sunday afternoon, The Mai-Kai displayed rare artifacts from its archives exclusively for Hukilau attendees. 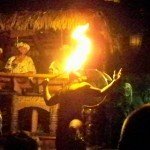 This entry was posted in 2011, Cocktails, Cocktails, Events, Events, History, Hukilau, Mai-Kai, Photo galleries, Rum, South Florida and tagged Beachbum Berry, Hukilau, Mai-Kai, Mariano Licudine, rum, South Florida, Trader Vic's. Bookmark the permalink.